My daughter has a thing for chairs these days and she loves to rock. So for Christmas we thought about ordering her a special child's rocking chair that she could have and maybe pass down to her own children someday. I looked around online and didn't really see anything earth shattering. Then I happened to come across this little guy at Goodwill for around $5. It was solid wood and felt really sturdy. The finish wasn't great but I knew I could paint it. Thankfully we had a few warm days in December, so I grabbed the spray paint and gave it a few coats. We actually gave it to her for Christmas, I'm just a little late sharing it. 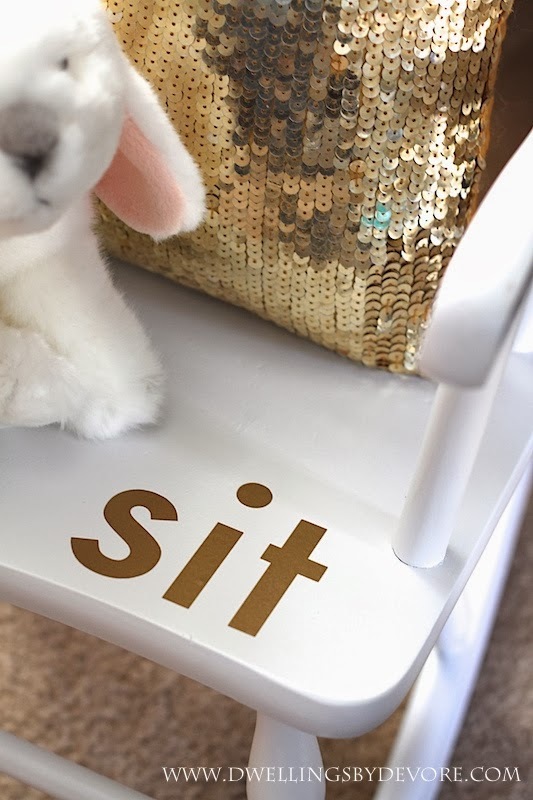 To make it a little more special I added a gold vinyl decal in the corner that says "sit." I used my silhouette machine, but you could easily do this with a stencil. She loves it and I'm hoping it will be something we can keep in the family for a while. I always think it's neat when pieces have special family history. Do you have any family heirlooms? This is so pretty! Love the pillow too. that is the sweetest! love the "sit" on it!!! I love little old rockers like that! We're already done with ours and it's in the attic :(. I've got to get my hands on one of those gold sequin pillows! Yes...a little upholstered rocker made by my great-grandpop in 1952 :) Love those sequins with your chair too! Aww, it's adorable!! Love your fun styling, too! Yay, I'm able to comment again, sorry there was a glitch for a bit, but I never miss a thing! Happy weekend! I love this, it reminds me of my daughter when she was little, she had a rocking chair at her grandma's and she used to "rocky baby" in it. :( This is such a cute little piece for your daughter and before you know it you'll be telling stories about how she used to rock in it! Love it! This is super adorable. The decal is such a cute touch! 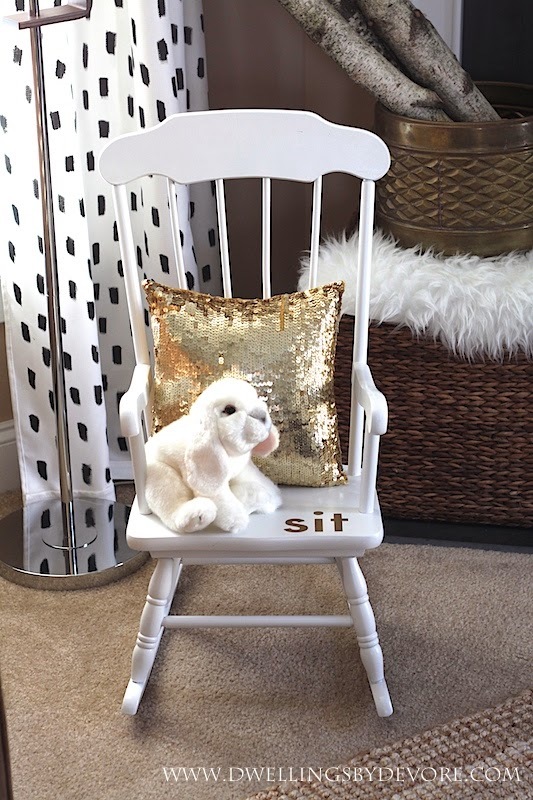 I have a shabby chic rocking chair that totally doesn't work with the decor in her room. Maybe I'll have to give it a few coats of paint! Aww! 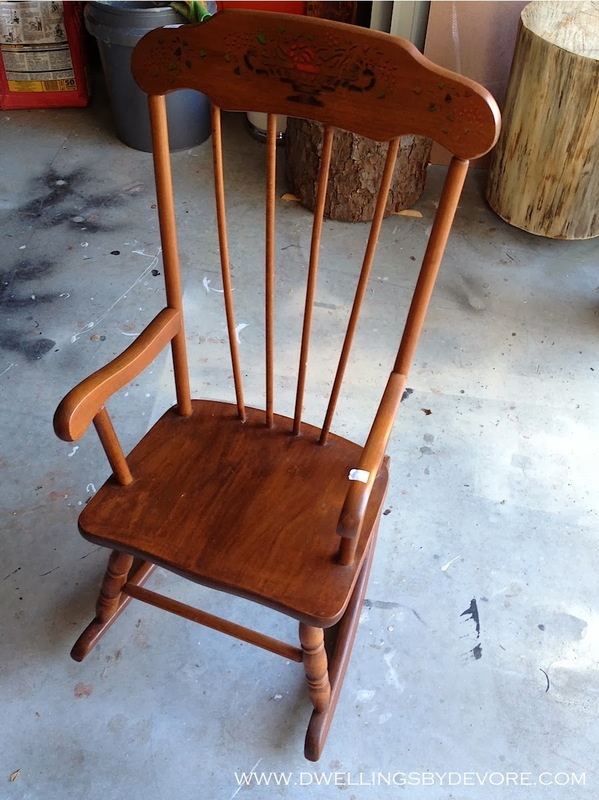 I love the idea of "investing" in pieces that can be heirlooms... even if the investment is only $5 from goodwill! It turned out so cute and fresh-looking!